Through the years I have received numerous requests for a flashlight hosting one of the Nichia High Power UV LED's. I've done a few customs but pretty much just built some for for myself and a few others. I finally bit the bullet and had a run of custom MCPCB's made for the latest generation UV LED, 033A. I have made up a few 3 speed light engines with these LED's designed to run off a single lithium primary or rechargeable. The LED is rated at 700 mA max and the light engines drive the LED at a target of 500 mA with the medium and low levels PWM reductions in duty cycle at 500 mA. I can and will make up more as needed now that I have the MCPCB's. Should I get caught short, there could be lead time involved in getting more LED's. The beam is about the same coverage comparing the Haiku spill angle with the XR-U spot flood angle. The Haiku has an intense and well collimated spot that throws quite well by virtue of the tiny image size of the UV LED. What is not apparent in the beam shots but is noticeable to the naked eye is that the XR-U has a slightly more intense outer ring compared to its center. At least this is the case for the visible light that is emitted. The 365nm LED does have some visible light but it is not intense and certainly does not overwhelm any target items which fluoresce. The 033A LED is a very impressive LED and they don't come cheap!! For more info, I have uploaded the spec sheet PDF which can be found, HERE. It is not a toy and it needs to be used with regard for safety for yourself as well as others. I don't know what demand there might be for these but I won't know without making them available. Initially I am going to offer the UV LE in 4 options and see how it plays out. I have a hand full of the aluminum EN Aleph Mule McClickie sets that can be host for one of these as well as the titanium Haiku and XR-U. So there are three posible turn-key lights to be offered as well as the LE alone. If you want a UV LE (light engine) by itself I want to suggest that it is compatible in an Aleph Mule head powered by a single CR123 or R123 cell. You can also host one of thess LE's in an Aleph A19 head but you will need to shorten the length of the reflector. You can accomplish this by filing down the front end of the reflector until it and the LE fit properly in the head. You can also use an existing SunDrop XR-U to host one of these LE's. Please post any questions here in this thread so that others can benefit as well. The three complete lights are coupled with the 1x123 standard clickie paks. I will keep this initial post updated with any changes in the offerings or lead time issues should I run short of the LED's. I do not have the lights completed so there will be some assembly time required but this shouldn't cause any delay unless the demand for these exceeds my expectations. These lights can serve a real purpose for some of you but by in large, there are very specialized in nature and the cost of the LED itself is a real deterrent. To make it easier for computing the pricing of a UV based Light, Just add $30 to the price of a light configured with the XPG2 or 119V LED. For instance a Haiku HIVE XPG2 1x123 light is $460 so a UV Haiku HIVE would be $490. 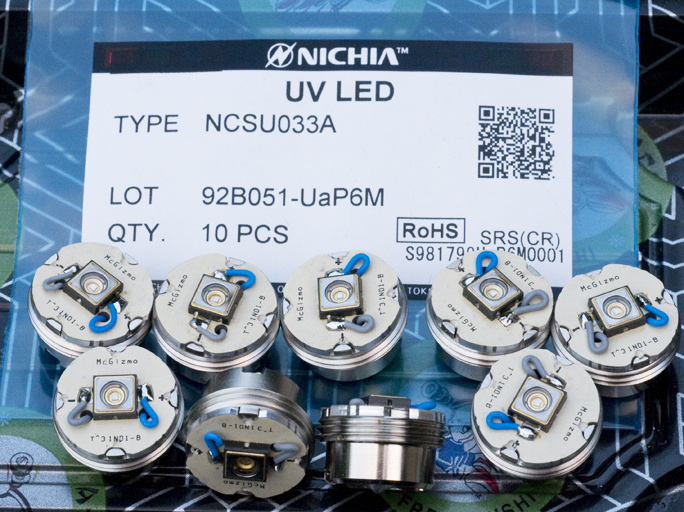 For more information on the new Nichia UV LED I am using, please refer to Post #254 in this thread. Can these be used to cure Norland optical adhesive quickly? Yes, cures Norland very quickly. That's what I use my Ti PD UV Mule for. Glad to see these are being offered & at excellent prices! Last edited by darkzero; 10-28-2009 at 11:16 PM. Are there other uses I am missing? I have been in touch with Will and Don. My interest in these are for photography- not just fluorescence but for reflected UV photography. They do not have any visible light output at all. The pdf has a spectral trace and that is true. I have checked it with a spectrometer. And despite the heat they generate, there is almost no IR from these either. So, whatever appears to be visible (pale blue) is a very small portion of the 375~380nm side bands. The true output is at 365nm and that is 50~100 times what is visible. This means, without proper eye protection, they are guaranteed to damage your eyes. These are unlike any currency checker flashlights out there! Any chance that you could put a small, discrete UV (or warning triangle similiar to what the shoppe did on the A19UV) somewhere on the lights, Don? I'd be happy to pay a bit extra for the effort. Besides the safety aspect, it could be useful to folks with both a regular and UV version of the light. Last edited by Codeman; 10-29-2009 at 05:00 AM. Email sent for a EN Mule UV. email send for 1. I've been waiting for this one for a long time!! a propper 365nm LE. that will have a nice, usefull life! @ Codeman: I'm going to get my Sundrop anodized to blue! just to be sure I don't grab this one instead of my xru. That's a question: is this also compatible with the original 1S Sundrop, Don?? I meant to comment that I have found that with either the XR-U UV or the Haiku UV, you can effectively check for the strips in bills or markers on drivers licenses and credit cards with the low level output. You certainly don't need full power with these lights in all cases and I think the 3S converter is a real boon compared to a single level UV light like those I built in the past. I will be putting a label on the complete UV lights I ship out but whether this is something you will elect to keep on them is up to you. I have a XR-U as well as Haiku UV now and I anodized both in blue so I wouldn't make any mistake and if I see a guest happen to pick up a blue light I will hopefully stop them before checking it out!! I can see already from this AM's e-mails that I will have to be on my toes so I don's mess up some of these requests because of the various options! With that said, I do want to eventually work into offering some of these components separately but not until I am convinced I can follow through effectively and efficiently without screwing up the order or any math involved! Some of you may wish to have a Haiku UV or XR-U UV head as an optional head but not a complete light. If you wish to purchase just the head without the Ti McClickie pak, we can go that route. The price would be the lights full prices less $170 for the pak. If you want to go this route, please use the bold distinctions in the subject line of your request. I've send the mail again, now from another address, hope that it now does arrive! but it is really unfortunate that the new LE doesn't fit the old head!! I had it reserved specially for that purpose! Can I change my order to a XRU UV (head-only)? Just to add to the order-logistic-nightmare?! Well, I just had one of those duh!! moments. My regular Haiku is sporting an etched clip, so I already have a way to tell them apart. Nevertheless, the sticker is welcome! I've had my fingers cross ever since the wave notification that a 3S would be offered. That clinched it for me. I received this e-mail twice (once for each of my addresses you used) I will hold off though and how about you sending me a new request, superceeding the one for the LE only. I am sorry that the UV LE will not fit in the original SunDrop head and I hope I never gave any indication that it would?!?! In the original SunDrop head, I located the lens as close as reasonable to the Nichia High CRI LED which is a low profile LED. The orignial SunDrop head is restricted as a result to just a few LED posibilities. The Osram Dragon without dome lens is one and of some possible interest going forward, the XP-G will also fit in there. No no, you never gave the impression that it would fit, I just assumed that it would fit as it is a nichia as well. I've been looking and reading, but it is a Class IIIb light source, and that is a category that is considered to be not harmless. Having welded a lot in my previous life, I know the darn effect of UV-radiation first hand. It's not funny and you'll learn to avoid it. But the biggest problem is long term effects when "clouding" of the lens can occur. Also see http://www.ccohs.ca/oshanswers/safet...ding/eyes.html about "arc eyes". So, be warned, UV is nice, but not without it's potential hazards, if you have UV-goggles, use them when there is the need to look directly into the led light. Depending on the rank (Don, do you know what rank these lights are, P5, P6 or P7?) it will emit 190mW to 310mW of UV. But the UV-radiation from a Nichia 033a is nothing compared to TIG-welding, where mere seconds of exposure can already cause trouble. (mind you, it will take a few hours before the trouble start). So even when looking directly into it for longer than a few seconds, it isn't directly harming. But it is wise to avoid looking directly into it, because of the possible long term effects like cataracts. Last edited by AlecGold; 10-29-2009 at 04:09 PM. P6 (as shown in the first pic), about 270mW@500mA max. Last edited by Codeman; 10-29-2009 at 04:13 PM. Thanks, I did mis that! But it's 30-70mW more than the Cree 7090 and 25nm lower. It might not seem much, but for a lot of uses, this led will perform much better. 1. 3-Speed - on a quick read the 365nm UV is "barely" visible - how easy is it to discern what level you are on? Last edited by nfetterly; 10-30-2009 at 05:32 AM. If you wish, I can post a link to this thread in some photo fora. 1. I shine the light at a wall or my hand and there is enough visible light to tell which level you are at when you cycle through the levels. In the dark, it is easier to determine. 2. Sorry but offering the BB Haiku sets complete is enough additional flavor options to add inventory and other issues at this end. I appreciate the offer but I leave it to your discretion. For someone not familiar with my "history" here and way I do things, it might be confusing and add more e-mail traffic that can be overwhelming as well as frustrating and time consuming at times. 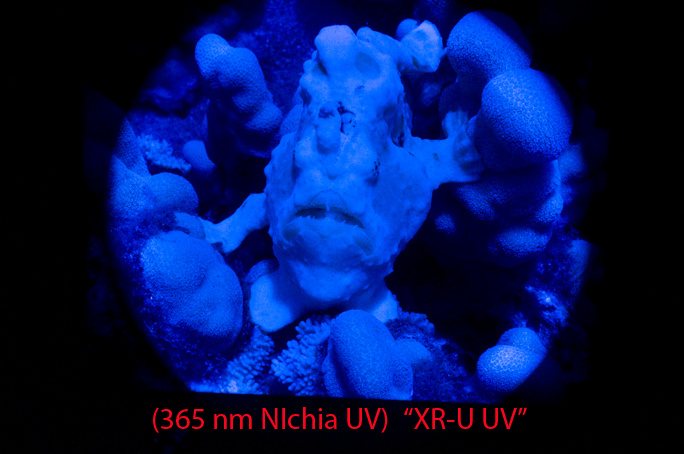 I admit I am not familiar with the use of UV for photography beyond getting targets to fluoresce and I checked some of you images which are cool but I am clueless as to what part UV played in their capture. Actually, it's going to be 70mW higher than the Cree7090 at about 270mW all of the time. Since PWM is being used at a constant current of 500mA, the lower levels will still be at 270mW, it will just won't be continuous due to the reduced duty cycles. You are doing a fantastic service by offering these. I would like to record my personal thanks to you! Last edited by Vivek; 10-30-2009 at 04:08 PM. 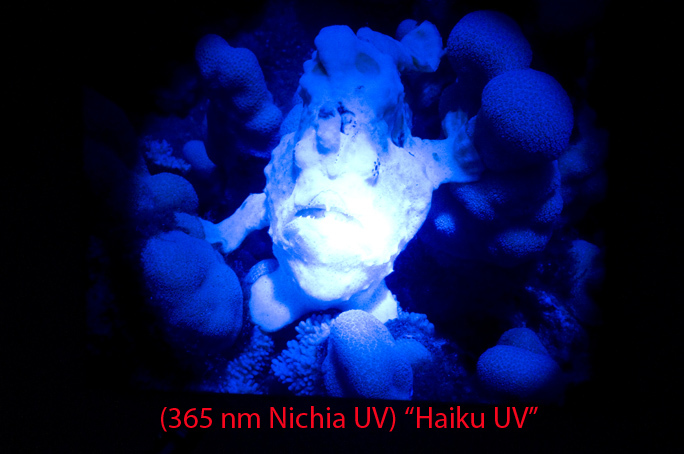 For the Haiku UV complete light, is the reflector modified at all to accommodate the taller Nichia UV LE? We have touchdown, though it came with a "recevied in damaged condition" sticker. Had the Haiku UV not been inside, it looks like the box would have been totally crushed. No worries, though, it fired up just fine! Oooh, cool, how is the 365nm? how well does it light up stuff? How "unvisible" is the beam? ?